The Endeavour astronauts bid their space station colleagues farewell early Friday, sharing hugs and handshakes before returning to the shuttle and closing hatches in preparation for undocking Friday evening. "It's been an awesome mission, you guys did a great job," station commander Jeffrey Williams told the shuttle crew. "Congratulations on all the work with the (new Tranquility) module and getting the (life support system) racks moved, the cupola, we're really going to enjoy the view. Wish you guys could stay a little longer." "We will if you'll keep us," joked shuttle spacewalker Nicholas Patrick. Hatches between Endeavour and the space station were closed at 3:08 a.m., setting the stage for Endeavour's undocking at 7:54 p.m. Friday and landing back at the Kennedy Space Center Sunday night, weather permitting. Space station engineers, meanwhile, are troubleshooting an apparent urine leak in the lab's water recycling system that has resulted in about two pints of waste water "that is not where we think it should be," said shuttle Flight Director Kwatsi Alibaruho. 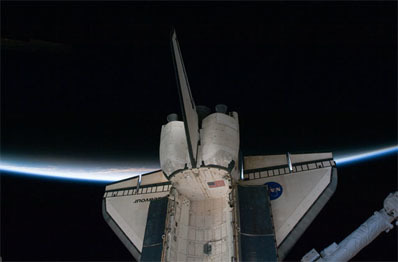 The problem developed after the astronauts moved the station's two water recycling system racks, along with the NASA toilet, from the Destiny lab module to Tranquility. "After we finished relocating the racks yesterday and we started to power up the system, part of that nominal power up sequence involves transferring about a half liter (about 1 pint) of urine from the waste and hygiene compartment system to the waste tank storage assembly," Alibaruho said. "When that transfer was complete, what we would normally expect to see is a pressure-quantity increase in the tank and for that pressure and quantity to remain stable. What we saw was, we saw the quantity increase and after we finished the transfer, it went right back down, which suggested to us that the tank was not holding the liquid that was being moved into it. We repeated the procedure again today after doing some other reconfiguration and saw the same thing, it was about a half liter. "So essentially, we've got a full liter of fluid that is not where we think it should be," he said. There are two possibilities. Either the urine has leaked through a flow control valve into downstream plumbing or it has leaked out of the tank and is floating freely in the recycling system rack. "We do not think it's the latter, because obviously there would be fairly conspicuous secondary indications if you had a liter ball of urine floating around in the cabin," Alibaruho said. "We've had none of those indications, no odors, no sign of water in and around that rack." The station astronauts plan to open the rack in question overnight Friday "so they can inspect the valve, inspect the fluid fittings, all the plumbing in and around that tank to try to help us identify what the problem is," Alibaruho said. "The engineers suspect they may know in general the area where the problem is, but we won't be able to verify until we get some hands into that rack and some eyes on the equipment," he said. "But we've got good reason to believe that it is probably not an external leak from the tank into the cabin." Spare parts are available on the station to address a variety of problems and in the meantime, the toilet in the Tranquility module is operational. But until the problem is resolved, the astronauts will have to offload urine into a limited number of Russian storage tanks. "Based on the supply of (tanks) we have available for this use, we need to get to the resolution of this within about two days, maybe three," Alibaruho said. After that, "we will be in a situation where we have got to basically all use the Russian toilet, and then we've got another set of logistic challenges there, or maybe think about venting the fluid (overboard), which of course there are a bunch of other logistic challenges there." "Basically, we've got spare components," Alibaruho said. "We've got to wrestle the system back to health within a couple of days, one way or the other." Alibaruho started his NASA career as a space station life support systems officer and he said Endeavour's mission "represents the completion of a system that I was working on for a good 10 years before I became a flight director. And we knew this was going to be a barrel of laughs."